Build the perfect floor mat that best matches your Corvette - any model, any year, most colors! Select the carpet configuration, logo (all generations, C1 through C7), thread color, carpet color, and binding, and we'll build them just for you right here in the USA! Using the latest technology to ensure a perfect fit for every Corvette model, Lloyd Mats provide greater coverage and protection than other OEM mats on the market. Simply follow the 5 easy steps in the CONFIGURATOR to create the custom mats you want. The mats will be built to your specifications and shipped direct from the manufacturer. LUXE™ custom fit Corvette mats are made from yarn so soft you'll want to drive barefoot. This unique, sophisticated and upscale automotive floor mat is sure to please even the most discriminating driver, with 11 luxurious carpet color options, hand beveling details this 48oz per yard construction. Dozens of licensed Corvette Logo options to choose from. 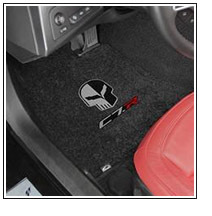 Ultimats™ have the most to offer in custom options for Corvette floor mats. Each mat is custom made from handmade patterns digitally mastered in Lloyd's CAD system to achieve the best coverage and fit possible. Mat colors are specifically designed for the best match and complement to all Corvette interiors. Choose from the largest variety of Corvette logos available. ATTENTION 2007 Corvette owners: Please check your floor mat fastening system and select the correct option (post or hook) when ordering.